Classic crystal clear penetrated point, white phantom [rarest], one fleabite, tremendous rainbows, self-healed base, and crazy glitter crystals is ready to be yours. 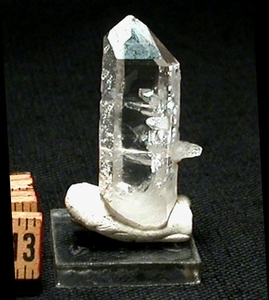 Host crystal: 5/8x 1-3/4". Longest [outside] penetrator: 3/16x 7/16". Longest [inside] penetrator 2/16x 7/16". White phantom, only visible through the two broad sides: 3/8" high. Look sharp and you'll see a large holographic-style record keeper. Much more gorgeous than photos show.